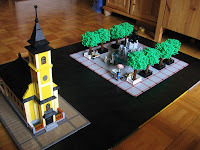 Brick Town Talk: The Akos Town - LEGO Town, Architecture, Building Tips, Inspiration Ideas, and more! You know Akos and his amazing old school buildings and layout. But his city is not over yet, it's always in progress so see these new little and cool details that will certainly make his town look a whole lot more alive! Love all the details in the square, and those trees - NICE. Check out more of his stuff in MOCpages. Words from the creator: "When I built this square, I did not have access to my houses as they are stored elsewhere. By now I have some confidence in my building skills but I can't be sure that I used the right proportions until I have actually seen the whole thing as a unit. I'm already concerned about the trees, I think they will look too small. They should be at least twice as big. And I already spent a fortune on those plant leaves pieces. We'll have an event in March so I don't have to wait too much before I'll have the space and occasion to set the whole thing up. There will be a lot more minifigs and some vehicles on the dio as well. Anyways, let us all keep our interest in building in the CC style!" Yeah that fountain has got a whole bunch of breathtaking details! Roger - thanks for posting, even so this dio does not sport any CC modules. wwfmike and Mark - thanks for the appraisal. I can hardly wait to be able to join this segment with my existing CC modules, I hope it will stun even myself, the (not-so) humble builder. What I mean is that when I built this square, I did not have access to my houses as they are stored elsewhere. By now I have some confidence in my building skills but I can't be sure that I used the right proportions until I have actually seen the whole thing as a unit. I'm already concerned about the trees, I think they will look too small. They should be at least twice as big. And I already spent a fortune on those plant leaves pieces. We'll have an event in March so I don't have to wait too much before I'll have the space and occasion to set the whole thing up. There will be a lot more minifigs and some vehicles on the dio as well. Anyways, let us all keep our interest in building in the CC style!